Choosing the best home generator can be complicated depending on what your requirements are. It can be daunting to make the right decision because generators are highly specialized. It can be confusing trying to understand the technical aspects of home generator. Bearing that in mind, we put together this detailed article to guide you through the process of selecting the best home generator for you — for your specific needs. We decided to cover every type of homeowner generator and recommend a few great models for each category (standby, portable generator, inverter generator, dual-fuel) We truly hope you find this home generator guide useful. Basically, we did all of the research for you so you don’t have to spend countless hours doing it yourself. If you’re looking for a generator to provide backup electricity during a power failure or to use when traveling to remote areas in an RV, you could become confused by the many options available. Generally, people looking for a home generator want it for emergencies. If you live in an area that experiences natural disasters like hurricanes, you may require backup power for days at a time. In some areas, where brown-outs happen frequently, people will want to use a generator for a few hours when the power in their area is down. Hunters and adventure tourists will want reliable electricity in areas where there is no other power source available. Because there are so many reasons why someone may be looking for a home generator, we’ve compiled a list of generators that will fulfill the requirements of any domestic user under one single banner – Best Home Generator. Match the generator to your power requirements. There are so many different appliances that you may want to run off your home generator. In order to help you decide which home generator will service all your needs, we’ll provide you with all the information that you’ll need to make an informed decision. Once you’ve read the review of our top choices for home generators, continue on to a comprehensive guide that will explain what to look for and how to calculate your electricity requirements. After reading this article, you should have no doubts about what to look for when buying a generator for your home or recreational needs. The term standby generator describes a large generator that supplies power directly to your main power supply. It, therefore, replaces the grid power in the event of a power failure. With this type of generator, all the power in your home will work as normal during a power failure. Traditionally, these generators usually use powerful diesel engines. The benefit of using diesel power is that it provides a lot of torque, even at low revs. So a diesel generator is not easily affected when the load increases, providing stable voltage as high current devices switch on and off. Though with modern electronic control systems, many new gas generators are able to provide power that is just as stable and cost less to purchase and maintain. 50% quieter. Includes a Dual 200/400 split amp Transfer Switch. Standby generators are large units that are permanently installed. Your mains power and the generator are connected to a transfer switch which usually works automatically. A transfer switch is a contactor with two inputs and one output. One input will receive power from the main grid supply and the other will receive power from the generator. The output will be connected to your power distribution board (circuit breaker box). Under normal conditions, the switch will supply power from the grid. When the power fails, it is switched either manually or automatically to the generator circuit. This prevents the two power sources from being connected at the same time. An automatic transfer will use an electrically controlled contactor. When the mains power is present the contactor will keep the switch in the mains position. When the mains fails, the contactor will open and will signal the generator to start. Once the generator is running, the contactor will switch to the generator position. When the main power is restored it will switch back to the mains position and signal the generator to switch off. Because the main power can sometimes “dip”, meaning that voltage may drop for a short period, the automatic transfer switch will always delay the switch over process by a few seconds. This prevents the generator from starting and stopping repeatedly when there is only a very short power interruption. Power dips are fairly common during peak power usage times and can happen in rapid succession. If there isn’t this delay your generator can sustain damage from repeated and rapid starts and stops. Standby generators are by no means cheap and require a professional installation by a certified electrical contractor. The benefit of this system is that they deliver a high current, sufficient to run all your household appliances. You won’t experience any difference between the power supplied by the mains and that of the generator. This is the same standby system that is used by hospitals and other buildings with backup emergency electricity. Includes : 200 Amp NEMA 3 (indoor/outdoor rated) whole house smart transfer switch. Generac generators and engines are engineered and built in the USA (Built in the USA using domestic and foreign parts). G-Force Engine is a purpose-built, pressure-lubricated engine capable of handling the heavy stresses of generator use. More reliable and requires less routine maintenance competitors generators. This is a 22KW generator so it provides enough current to run all household electrical appliances including central air conditioning, water heaters, pumps, and all other high current apparatus. The 200A transfer switch allows for switching between mains and generator for both 120V and 240V. The Generac G-Force air-cooled engine is designed and built specifically for generators. Pressure lubrication allows this engine to run smoothly under the heavy load conditions that are required for reliable electricity generation. The generator has a self-test mode known as Quiet-Test. This will run the generator at low revs for a test period of five or twelve minutes, making it much quieter than many others and reduces fuel consumption. Power delivery is extremely accurate. The True Power technology system used in the Generac 7043 produces a very stable sine wave with less than 5% harmonic distortion. This means that even very sensitive electronic equipment will function perfectly without sustaining any damage. This can be of great importance if you’re using finely calibrated medical equipment. State of the art technology is used to provide you with important information about the functioning and condition of the generator. It has an LCD screen to display that allows you to monitor the battery status and check on service intervals. Mobile Link technology gives you full remote access to information sent to your smartphone or tablet. This means you can monitor its operating status and service schedules from anywhere in the world. Generac’s G-Force engine is engineered to handle extreme operating conditions. It’s a large unit that needs to stand somewhere in the garden. This means that you want something looks good and is protected from the elements. It has an excellent combination of stylish design and long-term durability. An aluminum housing with a Rhino Coat powder-coated finish provides excellent protection. It is corrosion resistant and it will look good for many years. A generator like this is a major investment that will increase the value of your property. So you want to know that it’s going to stand the test of time. The machine is built to sustain regular use, with great dealership installation and backup service, covered by a 5-year warranty. All this makes it a worthy long-term investment. Can be placed as close as 18” from structure. ✓ View or download the BROCHURE or the SYMPHONY II brochure for the Briggs & Stratton 40346. Briggs and Stratton generators have been around seemingly forever and I’ve seen some that keep chugging along, even after decades of abuse. With a name like Fortress, one should expect this model to live up to their legendary reputation for indestructibility. This generator is in the same class as the previous one, with a 20KW load capacity and 200A 120V/240V transfer switch. The 993cc engine runs very quietly and can, therefore, be placed within 18” of your home without noise being a problem. It has a very good power management system, dubbed Symphony II, this means that power output remains stable and reliable at all times and isn’t noticeably affected by load changes. This generator will not cause damage or problems with electronic devices like computers and TVs. The control system is fully automatic and it has a very useful remote system status and diagnostics unit that includes low-oil shutdown, as well as warnings for low frequency, engine over-speed, low battery, high temperature and transfer switch fault. The galvanized metal housing may not be as durable as aluminum but is quite good when it comes to resisting rust. Powder-coating adds to the durability of the enclosure and keeps it looking good for years. Reliable and well-priced. Hire a professional for installation. 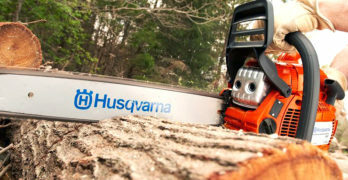 When it comes to feeling safe about investing in this machine, many will feel assured by the 6-year warranty. The warranty is certainly impressive but the galvanized housing is not as durable as that on the Generac 7043 nor are the electronic controls as sophisticated. So, perhaps the Briggs and Stratton has to take second place to the more advanced Generac. However, at a considerably lower price, many will be able to overlook some of the less admirable aspects of the Briggs and Stratton Fortress. It certainly is worth its price. Best home generator backed by a 5-year warranty for peace of mind. Have it installed by a professional. In just 10 seconds, will automatically power your AC, heat, sump pump & major appliances. Advanced voltage and frequency regulation along with ultra-low levels of harmonic distortion for excellent generator power quality to protect your valuable electronics. 5-year or 2000 hour limited warranty. PowerBoost technology provides excellent starting power. Kohler 14 kW generator can easily start and run a 5 ton air conditioner. Completely corrosion proof, even in harsh seaside environments, and is impact-resistant even at -34°C (-30°F). Fast Response : In under10 seconds, the generator automatically restores power to a 5-ton (60,000 BTU) air condition, major appliances and electronics. View or download the DIMENSIONAL DRAWINGS. Kohler has made a name for themselves, providing affordable generators of a good quality standard. The Kohler 14 RESAL-100LC16 is a compact and affordable generator that will supply ample power for most household needs. digital controller manages both the generator set and Model RXT transfer switch. While the normal operating load is not as high as the other two, it will supply 14KW which is sufficient to run everything you’d find in a regular modern house. To compensate for the slightly lower power delivery it has a 35KVA peak power capacity which allows high current machinery, using a capacitor to start (like AC units) to start without affecting the power supply. The heavy-duty 725cc engine is compatible for use with natural or LP gas. This is great news for environmentalists, concerned with emissions and prefer clean burning engines. The engine is remarkably quiet at around 63 dB, excellent for high-density neighborhoods. It has advanced controls which include a 100A indoor automatic transfer switch or a 200A outdoor automatic transfer switch with a 10-second delay. The digital voltage regulator is accurate within 1%, providing a very stable power supply at either 120V or 240V. It has a DC2 digital controller with LCD screen that monitors power usage and ensures a good supply while supplying the user with all the necessary information. The housing is very elegant and molded in composite plastic. Call me old-fashioned, but I still prefer a metal enclosure. Though I’m sure the Kohler’s housing will last well if protected from direct sunlight. It is a generally well-built and durable item that will keep running efficiently for many years. Kohler offers a 5-year warranty for grid use and this reduced to 18 months for off-grid use. For its price, the Kohler is a great option and their generators seem to last for as long as most respectable makes. I’m sure, that once considering the price, many people will be more interested in a portable gas generator. The added versatility means that a portable generator can be used to supply power to your home during power outages and be used elsewhere when needed. A portable generator won’t offer the same convenience as a standby generator. They will need to be started manually, there’s no automatic transfer. Because they are smaller, you’ll never be able to run a complete home off one of these. Though a generator of around 5KW with a reasonable peak load will keep the essentials running, including a localized AC unit though, most central AC units will draw too much current. Portable generators aren’t intended for permanent installation, using a transfer switch. They are usually used with an extension cord plugged directly into the generator. Most will have a high current plug which is convenient for RVs fitted with this type of plug. It is possible to have a portable generator installed so that it can run through the main wiring system of your home via a manual transfer switch. This can be done by an electrician who is familiar with this type of installation. You will be limited to only certain circuits that don’t exceed the load capabilities of the generator. A sub-DB can be installed and certain circuits, for example, your lights and a few plug circuits can be routed to the generator supply. This means that the transfer switch will allow all circuits to run when normal power is present and only the selected circuits will operate when switched to the generator position. This lowers the risk of overload but you will still have to be aware of what is plugged into these circuits when running on generator power. It may happen that certain appliances will have to be switched off in order to use others so that you don’t exceed the maximum current provided by the generator. Portable generators don’t have very large gas tanks and depending on how much load is placed on the generator, running times can be anything between 3 and 12 hours before the tank has to be refilled. Despite these limitations, portable gas generators are very popular because of their affordability and the fact that they will provide enough power to keep the basics running in an emergency. Their portability makes them the ideal solution for recreational users or farmers, contractors, and emergency response teams who need electric power where there is no grid supply. One of the best home generators for the money if you need portability on a limited budget. Westinghouse generators are extremely reliable and affordable. Great value. ✓ View or download the MANUAL for the Westinghouse WH5500. A machine that definitely seems durable and dependable with a solid 32mm (1.26”) metal frame. It has large rubber mountings and is ideal for hard working conditions. It has a 357cc OHV four-stroke engine with cast iron sleeves, delivering 5 500W constant power and 6 750W peak power. You won’t have any hassles running a fridge or stand-alone AC unit with this generator. The 6.6-gallon fuel tank provides good capacity with up to 14 hours run-time at 25% load. Though you’re more likely to be running it at 50-75% load, so expect somewhere between 5 and 7 hours. It uses regular unleaded gas with a conventional carburetor. The fact that it doesn’t have electric start is a little disappointing and this is the only drawback I can find with this generator. Recoil starters can be difficult, especially in cold weather. The choke and fuel tap are manually operated, which really isn’t a problem once you get to know the choke settings. It has a great pulse-flow muffler that helps reduce the noise which can often be quite excessive with this type of generator. It has a nice, well laid out control panel with 4 regular 120V plug sockets and a twist lock 120V/240V high current socket for RVs or if you want to run power through a transfer switch to your circuit breaker box. It has a regular mains overload circuit breaker and a digital display for running hours. It also has a switch to select between run and stop. A built-in voltage regulator will protect your equipment from voltage surges. Generators of this size are usually quite heavy and despite being portable, can be rather bulky. This one weighs 168 LBS, measuring 28.75” (length); 27.5” (width) and 26” (height). This weight is made pretty manageable with two large, solid wheels and flip-down handles with comfortable rubber grips. It’s a very convenient unit that comes with a small bonus, as they throw in a funnel, oil and tool kit with your purchase. The quality of this machine is very evident in every aspect of its design and it is covered by a 3-year limited warranty. Truly a magnificent feat of engineering from CAT. Highly recommended and easily one of the best home generators you can buy. Recessed sockets and snap-fit protected covers keep vital connections protected. If you’re prepared to spend quite a bit more, I would really recommend the Cat RP7500E. Their heritage for industrial machinery, designed for the harshest working conditions, really shows in this generator. From its all steel construction and heavy duty frame through to the low vibration mountings and solid wheels, this generator just oozes rugged industrial design traits. Now we move onto the important part – how much power do you get from the Cat? For a portable generator, you really couldn’t ask for more. The 420cc OHV engine provides the horses needed to run a 7 500W generator with a peak load of 9 375W. With this kind of power, you could just about run the entire home’s power off the Cat with very little compromise. With the exception of a central AC unit, there’s very little that won’t run off this generator, provided you don’t have several high current appliances starting at the same time. The built-in voltage regulator will keep your equipment protected from surges. A classic portable generator built for heavy-duty usage. Professional quality. It’s very user-friendly with electric start and a wonderful control panel with six power outlets that have protected covers. There are four 20A 120V plug sockets, a 30A 120V socket, and a 30A 120V/240V outlet socket. Each power socket is protected by its own overload breaker and ground fault protection. The socket design helps protect them from water so it’s quite safe outdoors. The digital display is versatile too, displaying either voltage, frequency, run time or total run time. Fuel supply comes from a 7.9-gallon tank that should give you around 11 hours run-time at 50% load. That’s impressive for a machine with this kind of power. The self-protection features include low oil shutdown, low fuel shutdown, and tip-over protection – if the generator is accidentally knocked over it will shut down to prevent the risk of fire. No one can expect a large capacity solidly built generator to be light, so the 192.5 LBS weight shouldn’t come as any surprise. But the excellent weight distribution, large wheels and strong soft-grip, wrap-around handle take most of the stress out of moving it about. Perfectly laid out control panel with large bold knobs and buttons. Wonderful! If there were such a thing as 6-star rating, the Cat RP7500E would certainly be deserving of this. It really exceeds all expectations of what one would expect from a portable generator and its hefty price tag is well justified by its excellent build and superior power output. Cat provides a 3-year warranty with very reasonable limitations. Learn more by reading our in-depth article on CAT generators or visit the Caterpillar site directly. While all the generators we’ve discussed so far have voltage regulators and therefore produce a relatively reliable current, they don’t guarantee a pure sinewave and there will be a degree of harmonic distortion, especially as load increases. An inverter generator uses a transformer to change the AC current produced by the generator’s alternator into direct current and then uses an inverter to convert it back into AC current. This is referred to as double conversion. At first, this may seem like a pointless exercise. Why convert from AC to DC and then back to AC? This is because an inverter uses electronics to produce a pure sine wave with very little harmonic distortion. To better understand this let’s take a look at how an inverter works. Because we cannot see or touch electricity, it seems very difficult to understand. It is actually not that complicated and I’ll attempt to explain this in a simple manner. If you’re not too interested in increasing your knowledge of electricity, you may want to skip forward to our review of the best inverter generators. For those of you who are keen on understanding how this all works, keep reading. Let’s start with a brief overview of electricity and how it works. Electricity is generated by exposing electrons to opposing magnetic fields. The energy created by two magnetic fields pushing against one another causes movement. In a generator, there is no possibility for the magnets to move away from one another so that energy has to go somewhere. This energy is transferred to the electrons in the surrounding environment. All electrons contain a small amount of energy, when they become charged, they need to release this energy in order to return to their normal state. We can say that the electrons become excited, very much like a child who has eaten too much candy. In order for the child to return to normal, they have to run around or do something to release that energy. In the same way, an excited electron has to move away from the source of excitement to point where they can regain their normal state. With direct current (DC), the electrons will move in a straight line from the energy source (a generator coil or positive terminal on a battery) to a point of negative charge which is the negative terminal on a battery or the body of the generator. When alternating current is produced, electrons move back and forth between the energy source and a neutral point where the energy is less. This happens a pulsing motion. The difference between an electron’s charge at the point of excitement and that of its neutral state is called potential difference, measured in volts. We can see volts as the amount of energy that has been added to the electron. When we look at electron movement using an oscilloscope, we see DC as a straight line and AC as a wave which is known as a sine wave. Electrons move at a set speed between live and neutral, the term Hertz indicates how many times an electron pulses between live and neutral in one second. We already know that volts measure the amount of energy contained in an electron. The sine wave can be seen as a graph that plots the movement of the electrons relative to their energy (voltage). In the US normal household electricity is 120V at 60 hertz. This means that the base of your wave (its width) is 60 Hz and its energy is at the crest of the wave, 120V. If either the voltage or the speed is altered, the form of the wave is changed, it will become narrower if the frequency drops or shorter if the voltage drops. This distorts the form of the wave, hence the term harmonic distortion. A generator will increase its power to generate more current as load increases. There is always some delay between the time when current demand increases and the generator increases its capacity. This delay causes the voltage and or hertz to decrease for a short period. Likewise, when the load demand decreases, the generator needs to decrease its power. In this case, the voltage and or hertz will increase. A voltage regulator is fairly good at preventing over-voltage but not as effective at compensating for low voltage. The result is a distortion in the sine wave every time there is a major change in current demand. Modern inverters use Internal Gate Bus Transistors (IGBT) to plot a sine wave from DC current. The name is a mouthful, I know. If we look at the sine wave as a graph plotted on a piece of paper, it makes a little more sense. In order to change a straight line (DC) into a wave (AC), we need to plot several points along the X and Y axis and join the dots to form a wave. The more points we have, the smoother our curve will be. This is what the transistors do. They take one point from the negative line and another from the positive line and alternate the electrons between these points to achieve an alternating current. The transistors do this a few hundred times a second, creating hundreds of points that connect to form a near perfect wave. A CPU monitors and controls the pulsing of the electrons to maintain a stable voltage and frequency through a process called Pulse Width Modulation (PWM). In order to compensate for any breaks that may occur due to voltage drops and changes in power demand, capacitors are used to store and release energy as needed. The result is a sine wave that remains constant with very little fluctuation. Inverters usually have an HD of less than 3%. Why is low harmonic distortion so important? The complex electronic circuitry used in computers, TVs, and sound systems use semiconductors to process and interpret data. They manipulate voltage and wavelengths to produce these results. This means that they are susceptible to minute distortions in the sinewave. HD will not only cause semiconductors to behave erratically but also result in excess heat being generated and can affect the electron base of the conductor, causing damage. If you’ve ever watched a TV that is plugged into a generator, you would notice that the picture can sometimes become distorted, lines can appear on the screen and the sound can be affected by interference and crackle. All this is as a result of harmonic distortion. Every time this happens, a small amount of damage occurs to the TVs circuitry. If this doesn’t happen too often, it won’t have much effect on the life of the TV. However, repeated exposure to HD will cause long-term harm to any electronic device. This is very much like a car traveling on a gravel road. If you do this occasionally, not much harm is done. If you drive a car on the gravel road often, the suspension will begin to deteriorate rapidly and vibrations will cause some items to rattle loose. A generator that is not exposed to high loads (50% or less of the total watts that it produces), there isn’t much chance of HD. Once the load goes higher, the chances of HD increases. So if you use a generator fairly regularly, you use it at high loads and run electronic equipment on it, an inverter generator is recommended. Best home generator for light-duty power requirements. Integrated handles make this easy to move around wherever you need power. Integrated handles and wheels makes this an ultra-portable generator. This a small, quiet running generator (58 dB at 23 FT) that will keep basic equipment running in your home or RV. The 171cc OHV four-stroke engine enables the generator to produce 2 880W of constant running power and 3100W for peak load. This is sufficient to keep most appliances and lights running. It will handle a fridge or small AC unit but, when using any of these high current devices, will be limited to only a few other items like lights and a TV, computer or sound system. Running a microwave and fridge at the same time will probably not be possible. It has automatic overload protection, so it will trip when the load is too high and reset automatically when the load returns to normal. It also has a wireless remote that operates within 80 FT, this is very convenient for switching the generator off before going to sleep. The starter is electric and it has a recoil starter for when the battery runs flat. The layout of the control panel is good, with everything placed neatly and easily accessible. This includes two regular 120V outlet sockets, a high current 120V outlet socket and a 12V outlet for battery charging. It has indicator lights for run, overload warning and oil level. When the oil runs too low, the generator will switch off automatically. It’s nicely compact and not too heavy, 108 LBS. The fuel tank has a reasonable capacity in relation to the engine size – 1.6 gallons. This will give you around 8 hours at 25% load before needing to be refilled. Portability is made easy with sturdy with carrying handles at the back and front, as well as wheels at the back to move it around. The length is 25.1”, width 17.3” and height 18.3”. Compact inverter generator for light-duty power needs. 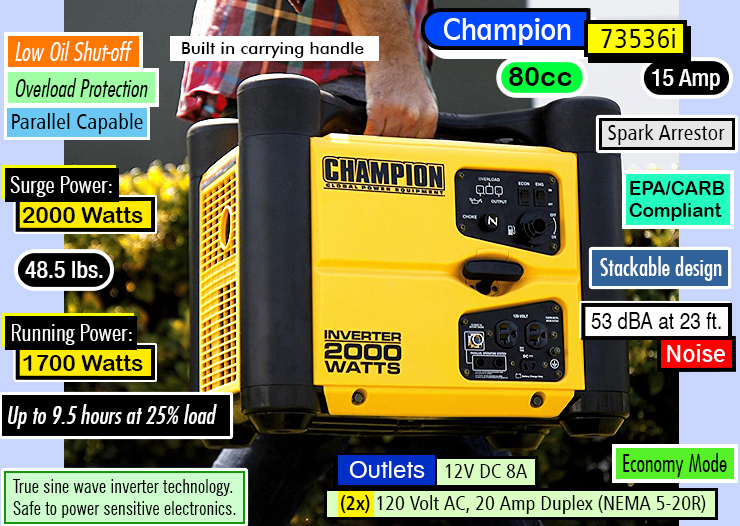 The Champion Power Equipment 75537i is a very handy generator to keep for emergencies and it has the benefit of an inverter to protect your electronic equipment. Remote control and quiet running are a definite advantage. It’s a very good-looking piece of equipment with a solid feel and comes with a 3-year limited warranty. The Champion Power Equipment 75537i has an EPA carburetor and is compliant with emission regulations in 50 states. Noise Level : 58 dBa at 23 ft.
It’s rare to see an inverter generator deliver this much power — one of the most power inverter generators from Yamaha : 6,300 Watt Maximum AC Output/5,500 Watt Rated AC Output. It’s not cheap but this is as good as it gets for an inverter generator. Professional quality all the way. Super Quiet : You’ll barely know it’s running — 58 to 64 dB. Can power a variety of high-demand devices, such as: Well pumps, compressors and RV air conditioners to sensitive electronics like plasma TVs, satellite receivers and computers. This inverter generator certainly ticks all the boxes. It’s powerful, economical, exceptionally quiet for a generator of this size, easy to use and looks quite cool too. The Yamaha EF6300iSDE offers a number of fantastic features combined with a high power output. It has a 357cc OHV four-stroke engine that pumps out an impressive 5500W constant running power and 6 300W peak power. You can run your fridge or AC together with many other appliances and have the peace of mind that your electronic equipment is fully protected thanks to the pulse width modulation (PWM) inverter. Noise Block sound reduction system makes it a very quiet generator. The Yamaha runs very quietly (58-64dBA) which is way better than many generators half this size. What’s more, the engine is super light on fuel. This can be attributed to the smart throttle design. There’s an economy switch that will allow the engine speed to be reduced and then automatically adjust according to load requirements. This means that the 4.5-gallon gas tank can keep you powered up for over 13 hours at 25% load – 1 375 watts constant load for 13 hours is quite an impressive feat of engineering. Operating the Yamaha EF6300iSDE is as easy as it gets with and electric starter and electric (automatic) choke. You also have the option of a remote control to make things even more convenient. It has well laid out control panel with outlets for 120V or 240V/120V. It also has fuel level gauge to make it simple to monitor how much gas you have left in the tank and power meter that shows how much electricity you’re using and how much is still available. An hour meter shows running hours so you can keep track of service intervals. Safety features include 20A circuit breakers, low oil shutdown, and spark suppressor muffler system. The Yamaha EF6300iSDE also has a low emission carburetor and is legal in 50 states, including California. Compact and powerful. Can run sensitive electronics safely. At 200LBs, it’s not particularly light but it has wheels on all four corners (with parking brake) and has bars on either side for easier lifting. Dimensions are Length: 30.7”; Width: 24.3” and Height: 27.2”. 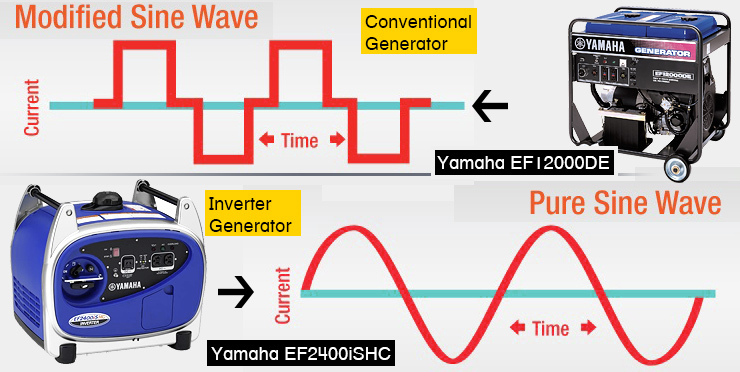 Yamaha quality has been proven over many years and this generator has a 3-year warranty. It combines all the features one could possibly look for in a portable generator with the convenience of easy starting and remote control. This is a really excellent piece of equipment. Stackable, lightweight and whisper-quiet : Operates at 53 dBA. Double your power using the 73500i Parallel Kit . 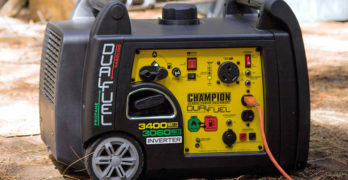 For a very affordable inverter generator, the Champion Power Equipment 73536i is a fantastic option. It’s small and compact, though limited in terms of power when compared to all the others that we’ve looked at so far. It delivers 1700W constant power and 2000W peak power. This generated using an 80cc OHV four-stroke engine. With 1700W you may be slightly limited to what you can run with this generator but it has the advantage parallel running, something I haven’t seen on other generators. With a parallel kit (sold separately) you are able to run this generator together with another AC power source to increase its output. So you can run two generators together when extra power is needed and the sine waves will be synchronized. A definite plus point for a small generator. Modular stackable design gives this an edge over more traditional designs. The 1-gallon gas tank will supply enough gas to keep it running for 9.5 hours at 25% load. Considering that it supplies 1 700W constant power, 25% isn’t very much and you’re likely to be running the generator at around 50% most of the time, so you should expect around 4-5 hours from a tank. It has a recoil starter which isn’t as convenient as electric but an 80cc engine doesn’t take too much strength to get going. Overload protection is automatic, it has two 120V AC outlets and a 12V DC outlet. 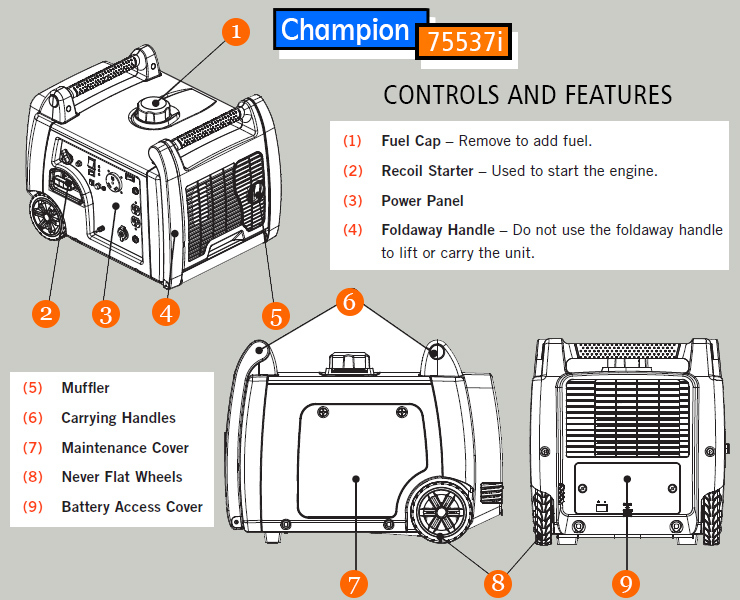 The Champion Power Equipment 73536i has a USDA spark arrestor and EPA carburetor, certified in 50 states. Noise levels are pleasantly low – 53 dB at 23 FT.
One of the great benefits for contractors and campers is the easy portability of this generator. It weighs 48.5 LBS with very well-designed carrying handles incorporated into the design. If you’re looking for an easy to transport portable generator for your RV that will run basic lights, a TV, and a microwave or small camping fridge, this generator will be perfect. I can also see it being very handy for contractors using a few power tools on-site. For home users wanting to run larger appliances, this generator will probably be too small. It’s lightweight and compact design also makes it ideal for yacht owners. Dimensions are Length: 19.3”; Width: 13.2” and Height: 16.3”. This generator comes with a 2-year warranty. The main reason why anyone would want this generator would be for its excellent portability and low noise levels. It’s a fantastic option people who want the protection of an inverter at a good price and don’t require a lot of power to run high current appliances. Noise Level : 53 dBA at 23 ft.
Dual-fuel generators or hybrid generators can use either LP gas (propane) or regular gas like other generators do. There are a number of reasons why this can be beneficial. Being able to use different fuel types gives one versatility, choosing between gas or propane depending on availability. The use of LP gas is becoming more popular for engines that are traditionally designed to run only on regular gas. This has come about, in part, because of the increased awareness of environmental issues and rising oil prices. LP gas burns much cleaner and more efficiently, resulting in lower carbon emissions. This not only reduces your environmental impact but also provides a safer environment for you – you are not breathing in as many toxic fumes when in close proximity to the generator. Another advantage of using bottled gas is safer transportation and storage. There’s no spillage or toxic fumes. This is more pleasant to be around and the risk of fire is greatly reduced. Gas cylinders are compact and the fact that the gas is compressed means that you can carry more fuel in a smaller container – less space, more running time. 12000 watts of power that can be generated by either gas or propane. When a disaster strikes you’ll want this generator on your side. Very affordable as well. Best home generator if you need raw portable power and versatility. 10 hrs. run-time on gasoline at 50% maximum output — 20 hours on propane. The excellent power output of the DuroMax XP12000EH makes it one of the best in its class. You’re looking at 9500W of constant power and 12 000W peak power. You certainly aren’t very limited as to what household appliances you’re able to run off this beast. The electricity is generated using a powerful 18 HP 457cc OHV engine that can run off propane or gas. The 8.3-gallon gas tank will give you 10 hours of running time at 50% load. When using a propane gas cylinder you double this time to 20 hours. This is fantastic for all-day hassle free power generation. Noise levels are good for a machine of this size, thanks to a clever muffler design. At 72 dB, few generators with this kind of power can compete. Built with a noise reducing muffler and spark arrestor. Starting is made easy with a combination of both an electric and recoil starter. Safety is good too, with overload protection, low oil warning light with automatic engine shut-off, as well as a spark arresting muffler. All your controls and power outlets are well organized on a panel at the side of the generator. These include two standard 120V power outlets, a high current 30A 120V twist-lock power socket, and a 120V/240V power socket. It also has a 12V power outlet for charging batteries. This is definitely one of the most powerful portable generators that you can get which also makes it one of the heaviest – 269LBs. Lugging this hefty machine around is made easier with really strong wheels and flip down handles with rubber grips. All this is contained in a rugged metal tubing frame. The engine and generator are supported by four sturdy rubber mountings. DuroMax offers a 1-year warranty on all their products, not as great as the other generators that we’ve reviewed, but this machine seems to be very well built so you shouldn’t have to worry too much about that. They also offer a 30-day, replacement guarantee. The biggest advantage of the DuroMax XP12000EH is its very high power output and the fact that it has dual-fuel capabilities. Up to 8 hours run time on a full tank of gas & up to 5.5 hours on a 20 lb. propane tank. While not quite as powerful as the DuroMax XP12000EH, this is by no means a small machine. The Champion Power Equipment 100165 also offers a great power output combined with the versatility of due-fuel running along with some great features. The power output of 7500W running power and 9375W peak power when running on gas (6750W running and 8400W peak for propane) is provided by a 439cc OHV four-stroke engine. Noise levels are pretty good, 74dBa at 23 FT. The gas tank holds 6.1 gallons, enough to provide 8 hours at 50% load and with a decent sized propane cylinder, you’ll be able to more than double this time. Has an internal battery charger — charges the battery as the generator runs. The versatile LED display gives you a choice of viewing volts, frequency or running hours. It has four regular 120V power outlets, each with their own circuit breaker as well as high current outlets for either 120V or 120V/240V power. Starting it is easy thanks to the electric starter. Safety compares with the best of them, low oil shut-off and a USDA approved spark arrestor muffler ensure that the generator operates safely and won’t sustain damage from low oil levels. It also has an EPA certified carburetor meeting emission regulations in 50 states. It weighs 202.4 LBs, measuring 27.8” (length); 28.7” (width) and 26” (height). The frame is made from durable steel and it has strong solid rubber wheels. The tubing frame wraps around and provides good gripping positions for when you want to wheel it about. Surge protector built into the panel of the generator. As with the other Champion Power Equipment generators, this one also has a 3-year warranty. Excellent quality combined with a high power output make this a fantastic backup power generator for a wide range of home equipment and contractors will be able to use a wide range of tools at the same time. Champion Power Equipment makes wonderful generators that endure over the years due to their commitment to quality. The 100165 is one of the best home generators if you want the flexibility of a dual-fuel generator. If portability is important to you, you’re going to want to look at the size and weight of the machine. This means that you may have to compromise slightly when balancing the weight and size against power output. Regardless of what physical size you’re looking at, the generator must meet at least your minimum power requirements. Calculating your power needs should be your first consideration. It’s a good idea to list what you intend running off the generator and calculate your total watt requirements. Exceptional quality as you would expect from Caterpillar. A true workhorse. You’ll notice that all the generators that we’ve listed above have ratings for constant or running watts and a peak power rating. This is because a lot of electrical equipment require a higher current to start. This is only for a short period, usually a fraction of a second. So your peak power rating is the amount of extra power that the generator is capable of providing for a short period in order to accommodate high current start-up equipment. Equipment that uses an induction (brushless) electric motor use a capacitor to increase the current to start the motor. Motors that start under load, like those used in fridges, air conditioners, and washing machines need the most power to start, up to three times the normal running wattage. Other inductive motors, like those used in some power tools, won’t require as much extra power to start. Other equipment that will require a higher start-up current are those that make use of a ballast, these include fluorescent lights, mercury vapor lights, and microwaves. For the most part, you need to concentrate on your running wattage, taking into account that some equipment will need extra power to start. Once you’ve listed all your electrical equipment, you’ll probably find that it amounts to a lot of power. You need to consider how often (if at all) you’ll be using all of these appliances at once and what are the chances of any two or more high start-up appliances starting at the same time. There’s no formula to calculate this and you’ll need to use your own judgment. Consider how you use the electrical equipment at home. This can will also vary depending on how people live in a home. Contractors need to consider how many people are likely to be using power tools at the same time and what kind of power these tools require. Even after compensating for some equipment that won’t be used too often and factoring in that not all will be used at once, you may find that your requirements may fall slightly above the power produced by a particular generator. Ideally, you should go for one that is larger but this will be more expensive and may be out of your price range. In this case, you’ll need to decide if you’re willing to comprise, sacrificing convenience for affordability. For the sake of saving money, you may opt for a smaller generator, which will probably mean that you’ll occasionally have to switch one appliance off in order to use another. This is not always ideal, but it does mean that you can get away with buying a cheaper generator. While you don’t want to waste money, buying a generator that is too powerful for your needs, going too small will cost you in the long run. Using a generator at more than 75% of its output capacity for extended periods of time, will result in excessive wear and shorten the life of the generator. You should aim for a normal running capacity of around 50%, only going above this for short periods of no more than 30 minutes at a time. To help you put together a good estimate of your power needs, the table below lists typical household appliances and tools that you may want to run on generator power. These specs are general running and start-up watts for most equipment types and may vary slightly. Wherever possible, you should try and get the exact wattage for the equipment that you’re using. However, the table below will give you a good indication as to how much power your equipment would require.